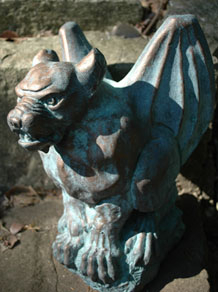 The Gable Gargoyle Company creates charming, individually handcrafted gargoyle statues that add a unique focal point to entryways, alcoves and roof crests on a universal easy-mount plinth. 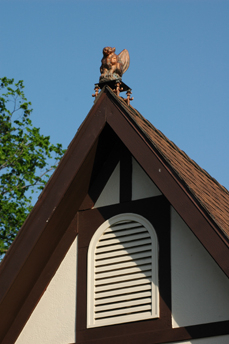 Gable Gargoyles are designed and built for homes as well as guest houses, studios, gazebos, and gardens. 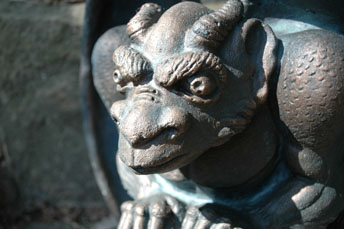 Gable Gargoyles remain in place to repel evil spirits and marvel welcome guests for ages. 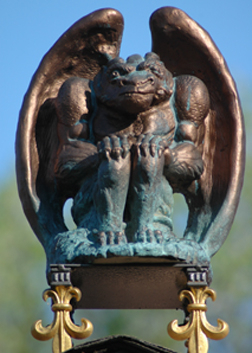 The Gable Gargoyle concept was inspired by the traditional location of gargoyles in Gothic architecture; at a place of prominence, high above its realm. 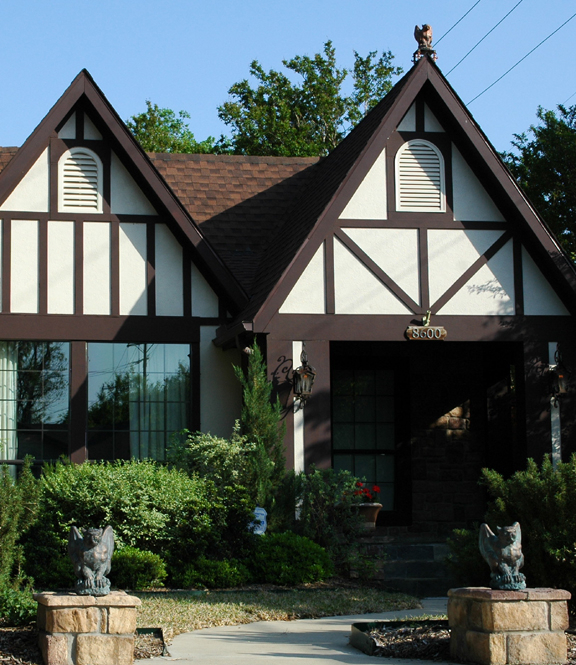 Our exclusive design allows homeowners to recreate that distinctive style on their own home or structure. 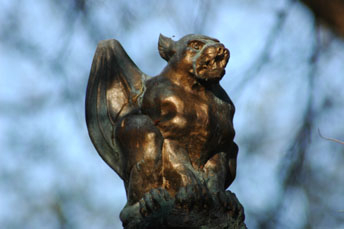 Gargoyles are intended to be seen, enjoyed and protect their keepers from their lofty vantage point, well above their domain. 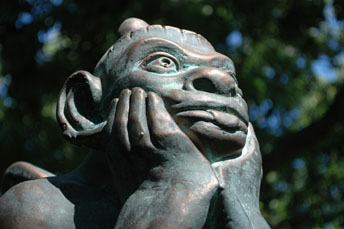 This concept is what makes Gable Gargoyles uniquely different from all other gargoyle statues or castings, whether found in stores, on the Internet, or at your home. 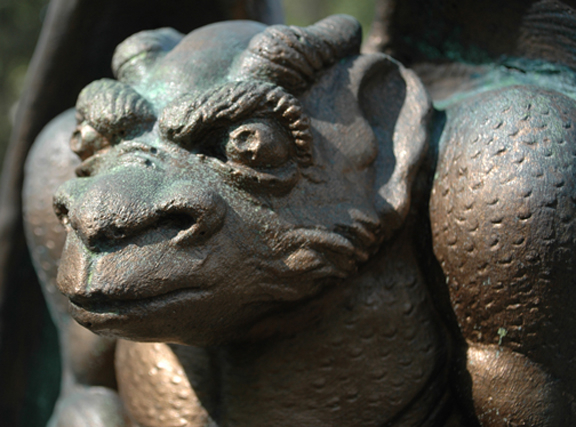 Gable Gargoyles make a statement far beyond simply a "conversation piece" - they are a true work of art, created for those with a distinct flair for ingenious and discerning design. 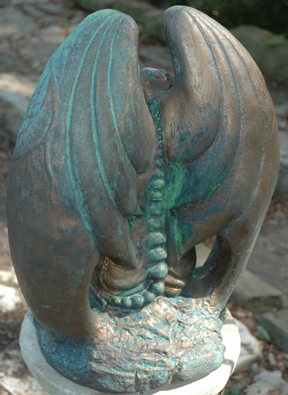 Each of our statues is hand-finished utilizing a unique process that bonds real copper, bronze, or cast iron to our cement castings. This is not metallic-looking paint, but the true element or alloy, cold-plated, with all the natural properties of solid metal. The tiffany patina is achieved through an accelerated chemical reaction and is not an artificially “painted-on” imitation. This true oxidizing process produces a centuries-old appearance that will continue to develop over time. 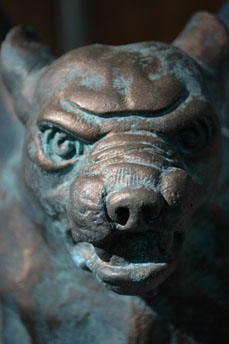 The GABLE GARGOYLE COMPANY, and its creator have been featured in THE DALLAS MORNING NEWS and ADVOCATE MAGAZINE. Gable Gargoyles has emerged as a top-selling sensation with high-end retail home decor and furnishings stores and is now available world-wide through this web site. Gable Gargoyles guard your household from all forms of evil spirits while marveling and warmly greeting your welcome guests. 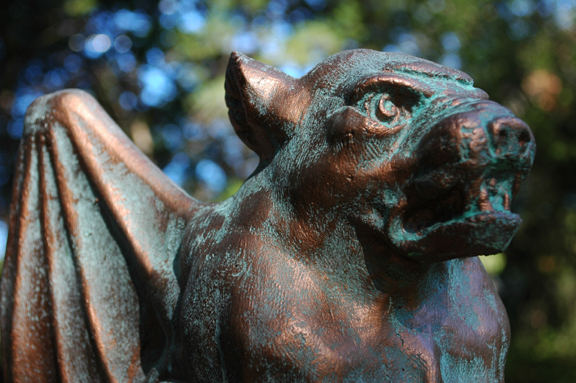 Why take unnecessary chances with gallivanting ghosts, loose gremlins, and the Forces of Darkness when all your loved ones and worldly possessions could be safely and securely guarded under the watchful eye of your own Gable Gargoyle? 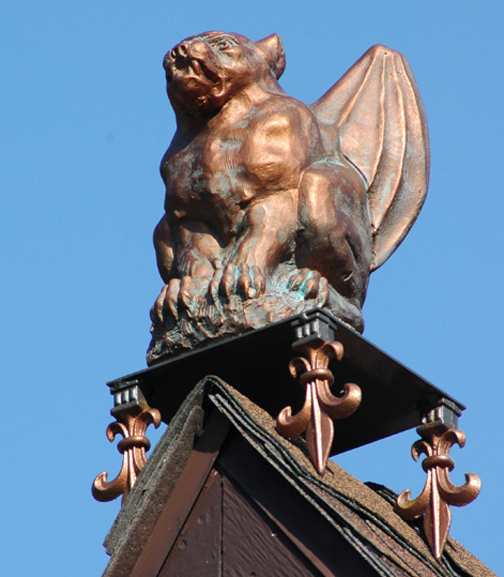 Gable Gargoyle statues will beam in the sun, cry in the rain, never fly away, and forever faithfully keep their vigilant watch above your realm. 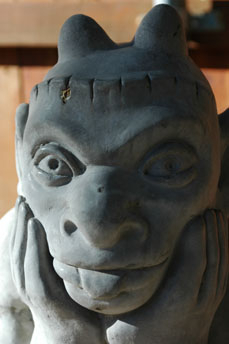 Now is the time to add that one-of-a-kind crowning touch to your home and there is a Gable Gargoyle eager to help. 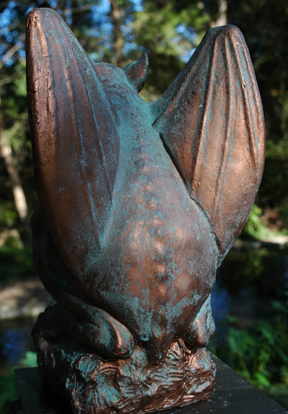 Each gargoyle statue includes a gable mounting stand or "plinth," finished in hammered bronze with copper accents. The plinth will easily straddle-mount virtually any style or pitch of roof gable without roof penetrations or tools. The plinth also makes a fine display stand in other locations. 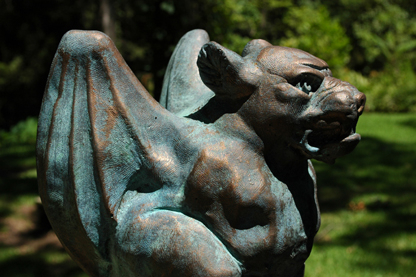 (The gargoyle maker's wife confiscated the first plinth ever made for the center piece of her dining room table) A Gable Gargoyle is the perfect way to accentuate the crest of any home and to protect all of its cherished contents. 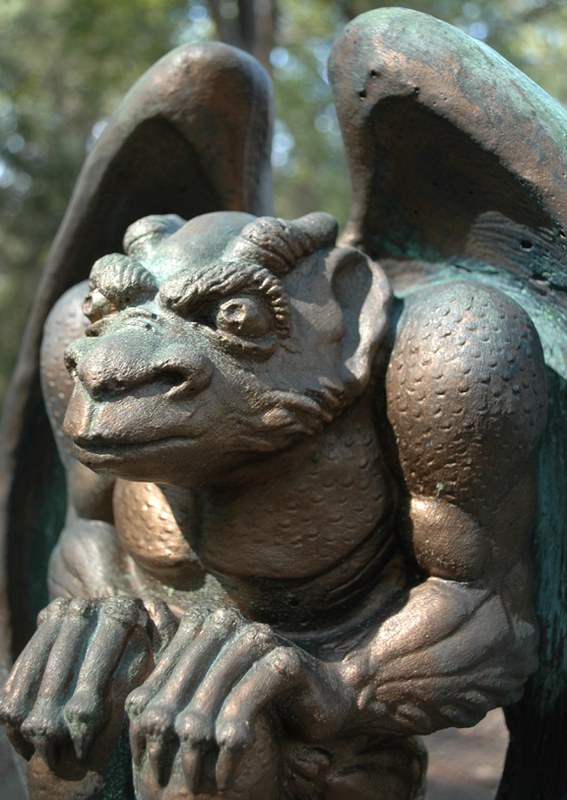 Your Gable Gargoyle and its loving enjoyment are just a few clicks away. 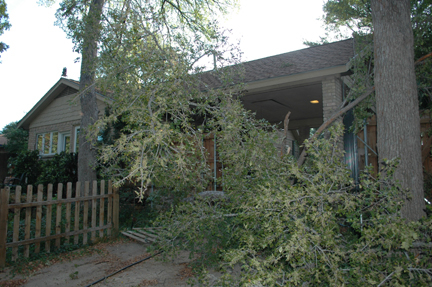 Tornado damage 9/29/2011. Herman still at his perch. Nothing touched the house. None of the four GABLE GARGOYLES even flinched. 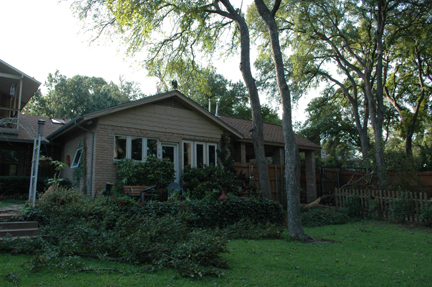 Tornado damage at house next door without a GABLE GARGOYLE. Draw your own conclusions. o Will these statues fall or blow off my roof? No. Each of these statues successfully endure every normal seasonal condition including; rain, hail, sleet, snow, Texas size thunderstorms with sustained winds over 40 MPH and gusts measured above 60 MPH (See photos directly above). Hit it with your own leaf-blower and see. They also withstand encounters with birds, squirrels, gremlins, evil spirits, etc. o Is it difficult to mount on my roof? No. While it is heavy enough to remain in its position, a person with average strength can carry it up a ladder or across a rooftop. 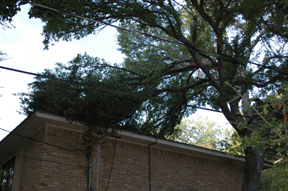 No roof penetrations or other tools are necessary. Ordinary precautions, an appreciation of gravity, and common sense are highly recommended. o Will the finish deteriorate? The finish is a true metallic based material, designed to last and weather over decades, similar to the element or alloy’s natural properties. They will continue to develop patina and age naturally well into the future. The finish provides decades of outdoor or indoor enjoyment. o How durable is the statue casting material? 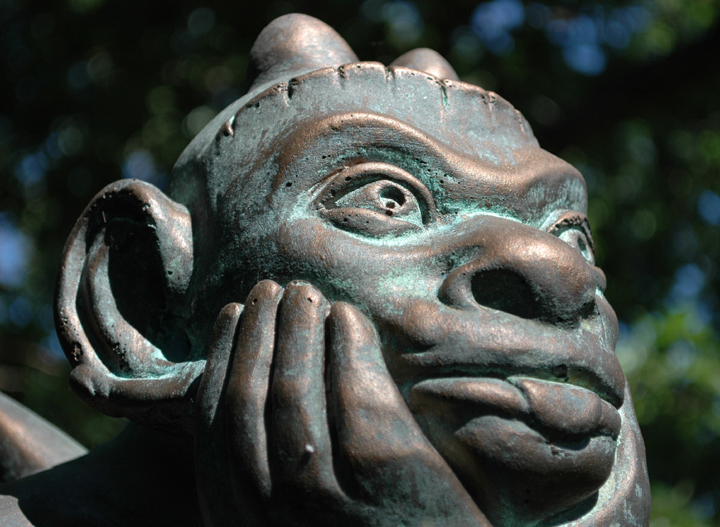 All statues are cast using a proprietary Portland cement/Pozzuolanic ash blend (not concrete). Portland cement is one of the most durable and hardest construction materials ever known. It is used for structural columns in most modern skyscrapers. It will continue to harden and cure for decades to come. The volcanic Pozzuolanic ash acts as an organic strengthener. 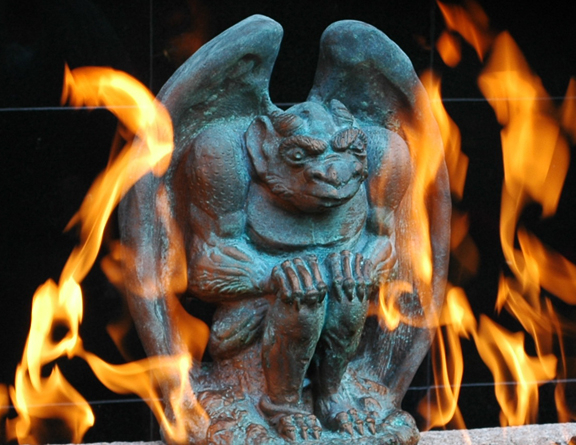 When and how is my Gable Gargoyle shipped? Items normally ship within 1-3 business days, via FedEx to the continental United States. Canadian shipping offered via FedEx International Ground. Special or other international shipping may be arranged in advance. "Great idea. Everyone loves it. No evil spirits either! ;)" ~Alonzo G.
"I put spitting gargoyle in front and herman in the back. They are just awesome." ~ John J. "We have Herman on our pool deck. He's even more amazing than I imagined and the plinth is the icing on the cake. Love him!" ~ Susan F.
We will cheerfully accept returns and issue full refunds for ANY REASON at all.